Stretching over some 400 square kilometres, including forested area, Angkor Archaeological Park contains the magnificent remains of several capitals of the Khmer Empire of the 9th to the 15th centuries, including the largest pre-industrial city in the world. The most famous are the Temple of Angkor Wat and, at Angkor Thom, the Bayon Temple with its countless sculptural decorations. Angkor itself has no accommodations and few facilities; the nearby town of Siem Reap, just 6 km. south, is the tourist hub for the area. The temples of Angkor are highly symbolic structures. The foremost Hindu concept is the temple-mountain, where the temple is built as a representation of the mythical Mount Meru: this is why so many temples, including Angkor Wat itself, are surrounded by moats, built in a mountain-like pyramidal shape and topped by precisely five towers, representing the five peaks of Mount Meru. The linga (phallus), representing the god Shiva, was also critical and while the lingas themselves have largely gone, linga stands (carved, table-like blocks of stone) can be found in many if not most rooms in the temples. There was also a political element to it all: most kings wanted to build their own state temples to symbolize their kingdom and their rule. One element that continues to mystify archaeologists is the baray, or water reservoir, built in a grand scale around Angkor: for example, the West Baray is a mind-boggling 8 km by 2.3 km in size. While it has long been assumed that they were used for irrigation, some historians argue that their primary function was political or religious. Not a single outlet is found in this reservoir even if it is inspected by eye or by NASA image scanning. Today, the moat around Angkor and the West Baray still contains water, but the rest have dried up. Angkor is hot and sticky throughout the year, but the peak season is November to February, when the weather is dry and temperatures are coolest (25-30°C). The flip side is that the temples are packed, especially around Christmas/New Year’s, and hotel rates are at their highest. March to May is brutally hot, with temperatures reaching 40°C. June to October is the rainy season, and outlying temples and the roads leading to them can turn into quagmires of mud. However, this is also when the temples are at their quietest, and it’s still often possible to do a good half-day round of sightseeing before the rains start in the afternoon. Angkor is located about 20 minutes to the north, by car or motorbike, from central Siem Reap. Siem Reap International Airport is the second largest airport in Cambodia. Its modern architecture is based on the traditional Khymer style. Its facilities are limited. There are separate terminals for international and domestic flights. Nazca is a town in Peru’s Southern Coast region. It is most famous for the so-called Nazca Lines, a mix of long lines, geometrical figures, and giant drawings in the desert sand. Today’s Nazca town is on the site of where the ancient Nazca civilization was based after the fall of its first capital, Cahuachi, in around AD 400. It has an exotic, dusty, desert setting but holds little enchantment in itself. It can provide between a few hours’ and a few days’ entertainment depending on one’s interest in the ancient Nazca people. For much of their history, the Nazca people were based in the Ceremonial City of Cahuachi, an ancient pilgrimage center 28 km southwest of modern Nazca. The society emerged in around 100 BC and was active untill around AD 750. Its influence stretched from Cañete in the north to Acari in the south. The lower section of the Nazca Valley was likely chosen to situate Cahuachi due to its abundent underground water, which allowed extensive irrigation for improved agriculture. This civilization was responsible for the famous Nazca lines, giant representations of animals and other designs that are also seen on Nazca pottery and textiles found at Cahuachi. Discovered pottery fragments also suggest that the Nazca people gathered in the desert to perform religious ceremonies, with objects being smashed as offerings to the gods in the sky. The fragments found in the desert among the Nazca Lines are mainly pieces of panpipes and whistles, suggesting the importance of music in the religious rites. A series of natural disasters, climatic and tectonic, began to undermine the civilization in around AD 350. An earthquaked finished the capital, Cahuachi, in around AD 400, leaving the society to limp into oblivion for next few centuries from its new base in what would become modern Nazca. Nazca culture first aroused academic interest through its pottery. In the 1890s, archaeologist Max Uhle was studying ceramic samples at the Anthropologisch-Ethnografische Museum in Dresden. The consignment contained many works from South America, including some striking and colourful work from the Nazca people. In 1901 he travelled to Peru to examine their origins. After months of searching he arrived at the Valley of Ica at a place called Ocucaje, where he met farmers who told him about the ancient cemeteries where these colourful ceramics were frequently found. Uhle excavated the sites and found Nazca ceramics at many of them. His work introduced Nazca culture to the wider world. The Nazca Lines were first spotted when Faucette, an early Peruvian airline, began flying from Lima to Arequipa in the 1920s. The pilots noticed lines criss-crossing the desert between the valleys of Palpa and Nazca. The pilots’ discoveries led Toribio Mejia Xesspe, an archaeologist, to come to Nazca in 1926. His research arrived at the conclusion that the lines were part of ancient sacred roads. Xesspe never flew over the area and so only saw straight lines; he missed the figures. A more worthy discovery of the lines was made in 1939 by Paul Kosok of Long Island University. Kosok came to Nazca to study the ancient irrigation systems, the puquios (see below). He surveyed the channels and noted that over 50 of the underground aqueducts were still in used. He was told of other, even older, ancient channels and so set out to the Nazca desert but found only long shallows furrows. He thought that perhaps these other ancient channels were located very far away and so hired a small crop-dusting aircraft to go and find them. On the flight he saw hundreds of lines and geometrical forms in the desert. He later recalled asking the pilot to follow one particular line and being somewhat surprised at it leading to a bird! Kosok later met Maria Reiche, who then devoted her life to studying and preserving the lines. After the fall of Cahuachi, the Nazca people still achieved some notable, though oft overlooked feats. An extensive series of underground channels, the puquios (a Quechua word to describe a natural spring), are one of the greatest legacies of the Nazca culture. This underground system is unique in South America, and perhaps the world, because of its very intricate construction. Over 50 underground channels were built over one hundred years starring in AD 400; many of them are still in use! Some of the best preserved channels are at Cantalloc, also known as Cantayo, where visitors can see a series of spiral blow holes, which were probably used to allow cleaning of the channels’ interiors and also to restore them after earthquakes. The cemeteries along the Nazca River contained the colourful ceramic works that first drew attention to the Nazca people. The high-quality work on vessels shows realistic and complex depictions of the ancient Nazca world: everyday life, animals, plants, fruits, birds, insects and gods are all represented. Vessels showing stylized creatures, including zoomorphic and anthropomorphic designs, sometimes contain over ten colours. Bridge-handle bottles with two landfills are the most common find, but spherical pots were also produced, as well as cups and glasses. The best examples of Nazca ceramics are in museums, such as the Museo Arqueologico Antonini in Nazca, the Anthropological and Archaeological Museum in Lima, the Regional Museum of Ica, and many others in Peru and around the world. The Nazca people’s belief in life after death led to mummification of their corpses. The shrouds wrapping the dead were fine textiles, which still retain their quality and colours. The Nazca people, like many other pre-Inca peoples, believed textiles to be spiritually important, leading their textiles to be skillfully produced and depicting sophisticated artistic scenes on fabrics of cotton and the fibre of Andean camels. Samples from the ancient capital of Cahcuachi can be seen at the Museo Arqueologico Antonini in Nazca. There are frequent collectivos (small buses) to and from Ica. They leave when full, it takes 2-3 hr and cost 12 soles. Getting around in Nazca is easy. You can walk almost anywhere and a taxi inside of town really costs around 3 soles although every taxi driver might try to charge you more. The big hassle in Nazca are the touts that hang out at the bus stations and on the streets. They represent shady or nonexistent hotels and travel agents, claim to work for your hotel or to offer cheap flights for viewing the Nasca lines. Ignore them and have your hotel pick you up from the bus station. Museo Arqueologico Antonini, Av de la Cultura 606 (follow Jr Bolognese about 1km east). Informative museum about the surrounding archeological sites. It also has a collection of pottery and textiles. In the garden there is a working aqueduct and a scale model of the lines. Entrance US$6. Nazca channels or puquios at Cantalloc The pre-Inca Nazca people developed a system of underground aqueducts to irrigate the dry lands that lacked surface water. Therefore despite the harsh desert climate, the Nazca region hosts fields of cotton, corn, beans, potatoes and fruit still watered by over 30 of these underground channels. Nearby are various geometric lines etched on the desert. There are also the Inca ruins of Paredones. Cemetery of Chauchilla For many years the Chauchilla Cemetery was looted by treasure hunters, who destroyed the place completely, taking away all the treasures the mummies kept in their tombs for centuries. Grave robbers just left behind the corpses, which can be seen today all over the ground. In addition to skulls and bones, visitors also can see several tombs centuries old, as well as long human hairs, ceramic fragments and others remains scattered on the desert surface. It is the only archeological site in Peru, in which ancient mummies are seen in their original graves, along with ancient artifacts, dating back to 1000 AD. This archaeological excursion is combined with the visit to a Nasca Ceramic workshop, where visitors will learn about the old technique of making Nasca pots and also a visit to the gold extraction centre to see an old way of extracting gold using huge mortars. Chicchitara Carving Rocks, in the Palpa Valley. 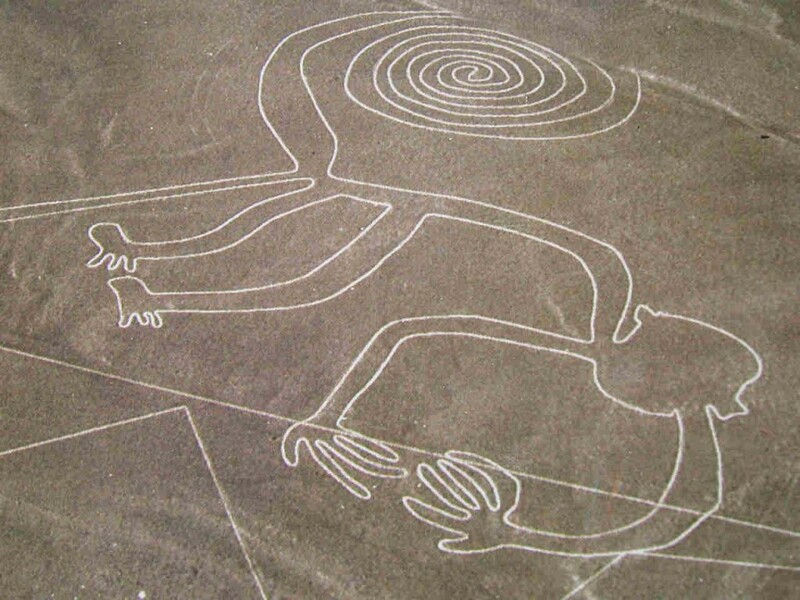 The Nazca Lines are the star attraction. Scattered over 500 km² of an arid plateau between the Nazca River and Ingenio River, they are huge representations of geometric patterns, animals, humans figures and thousands of perfectly straight lines that go on for kilometers. They were created by removing surface stones, revealing the lighter-colored soil below. They’re unquestionably ancient (dating back 1400-2200 years), and remarkably precise (with straight lines and clean curves). The images are so huge that they are only appreciable from the air, a fact which has led to speculation that the ancient Nazca people either had access to hot air balloons or alien helpers. Most academics attribute the lines’ precision to low-tech surveying techniques, but nobody actually knows who made them or why. Nazca town is full of hotels and tour agents pedling flights over the lines in Cessnas, few, if any, will offer a decent price. A seat in a four-seater plane (two pilots, two passengers)should start from US$50 in the low season, don’t pay more than US$90. Haggling is necessary. An airport tax of 25 soles is usually not included in the price. Longer flights which include the nearby Palpa lines are also available. Only consider booking in advance in the high season (December to March) as planes are going up and down all day and flights are generally only 30 mins, meaning that hundreds of people can be dealt with daily. Booking with flight operators directly at their airport sales desks allows for easy price comparison and ensures your money isn’t needlessly passed through brokers. Never deal with the touts at the bus stops, they will leave you very badly off. The cautious may choose to pay only after taking a flight but buying at the airport is safe enough. Flights run as required from 7AM-4PM, so don’t feel pressured, you’ll fly when you want to. The pilots love banking their small planes hard (for good views of the ground) and motion sickness can occur. Take a motion sickness pill if in doubt. There is a observation tower (2 soles) along the Panamerican highway with a view of three of the figures and a lookout on a mountain. If you get airsick, this is the way to go. You can go there by tour, public transportation, hitchhiking, or taxi (around 50 soles per car for a roundtrip). Buses from Nazca to Flores, Cueva or Soyuz pass the tower. Flag a bus down for the trip back to town. Easter Island (Spanish: Isla de Pascua, Polynesian: Rapa Nui) is one of the most isolated islands on Earth. 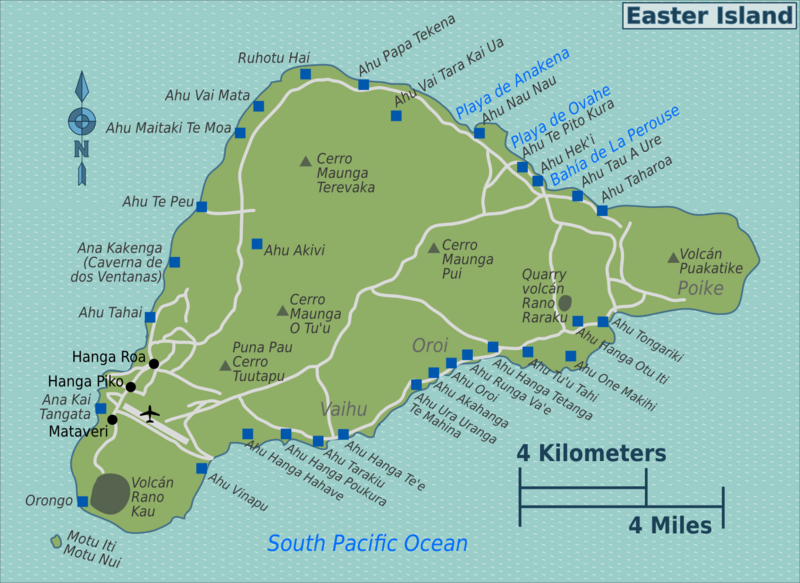 Early settlers called the island “Te Pito O Te Henua” (Navel of The World). Officially a territory of Chile, it lies far off in the Pacific Ocean, roughly halfway to Tahiti. Known as one of the world’s sacred sites, it is most famous for its enigmatic giant stone busts, built centuries ago, which reflect the history of the dramatic rise and fall of the most isolated Polynesian culture. Ever since Thor Heyerdahl and a small party of adventurers sailed their raft fromSouth America to the Tuamotu islands, far to the north of Easter Island, a controversy has raged over the origin of the islanders. Today DNA testing has proved conclusively that the Polynesians arrived from the west rather than the east, and that the people of Easter Island are descendants of intrepid voyagers who set out from another island thousands of years ago. Legend says that the people left for Easter Island because their own island was slowly being swallowed by the sea. In brief, the prehistory of Easter Island is one of supreme accomplishment, flourishing and civilization, followed by environmental devastation and decline. Although it is not agreed when people first arrived on Easter Island (with estimates ranging from several hundred to more than one thousand years ago), consensus seems to be that the first peoples arrived from Polynesia. Rather than being inhabited by mistake or chance, evidence has suggested that Easter Island was colonized deliberately by large boats with many settlers — a remarkable feat given the distance of Easter Island from any other land in the Pacific Ocean. The first islanders found a land of undoubted paradise — archaeological evidence shows that the island was covered in trees of various sorts, including the largest palm tree species in the world, whose bark and wood furnished the natives with cloth, rope, and canoes. Birds were abundant as well, and provided food for them. A mild climate favored an easy life, and abundant waters yielded fish and oysters. The islanders prospered due to these advantages, and a reflection of this is the religion which sprouted in their leisure, which had at its centerpiece the giant moai, or heads, that are the island’s most distinctive feature today. These moai, which the island is littered with, are supposed to have been depictions of ancestors, whose presence likely was considered a blessing or watchful safekeeping eye over each small village. The ruins of Rano Raraku crater, the stone quarry where scores if not hundreds of moai sit today, is a testament to how central these figures were to the islanders, and how their life revolved around these creations. It has been suggested that their isolation from all other peoples fueled this outlet of trade and creativity — lacking any other significant way to direct their skills and resources. The bird-man culture (seen in petroglyphs), is an obvious testament to the islanders’ fascination with the ability to leave their island for distant lands. However, as the population grew, so did pressures on the island’s environment. Deforestation of the island’s trees gradually increased, and as this main resource was depleted, the islanders would find it hard to continue making rope, canoes, and all the necessities to hunt and fish, and ultimately, support the culture that produced the giant stone figureheads. Apparently, disagreements began to break out (with some violence) as confidence in the old religion was lost, and is reflected partly in the ruins of moai which were deliberately toppled by human hands. By the end of the glory of the Easter Island culture, the population had crashed in numbers, and the residents — with little food or other ways to obtain sustenance — resorted sometimes to cannibalism and a bare subsistence. Subsequent raids by powers such as Peru and Bolivia devastated the population even more, until only a few hundred native Rapa Nui were left by the last century. Easter Island is extremely small, so it is possible to get around fairly easily. There are rental cars, generally jeeps, available from a few rental agencies in Hanga Roa, as well as a few dirtbikes. With a car, it’s possible to see most of the sites on the island in a few hours. Most hosts will also rent out their jeep to you (at a very competitive rate) if you simply ask. Be aware, you will not get insurance with your car hire. Bicycles can be hired on a daily basis. For those on a tight schedule, a rental car is really quite advantageous, and sometimes not much more expensive than other options and offering more independence for more curious or adventurous visitors than an organized tour. Bicycling may be tried, but note that aside from the main paved roads in Hanga Roa or the single smooth paved road to Anakena, roads to many main sites are of dirt and sometimes quite uneven and potholed, so the benefit of a car cannot be overstated for some parts of the island. Note that for motor scooters and motorbikes, a valid driver’s license specifically for these vehicles is required. Otherwise, driver’s licenses for cars will allow the use of cars or 4×4 quad bikes. Some example prices are as follows (all in CLP). At the time of June 2010, fuel/gasoline cost approximately 500 CLP per liter. One reliable, friendly, and relatively cheap rental location is “Paomotors”, found next to Supermarket Eixi. It seems the closer you get to Farmacia Cruz Verde, the higher the prices for various rentals. The biggest tourist attractions on Easter Island are, of course, the Moai. Please note that the Moai are archaeological features and should be treated with care as they are far more fragile than they seem. Often Moai will be placed upon ceremonial platforms and burials called Ahu. Do not walk on the Ahu as it is an extremely disrespectful gesture. Even if you see others walking on the Ahu do not do so yourself. All of the sites, which can be visited for free, are mostly found along the coastline of the island. First time vistors may be struck by how many archaelogical sites there are around the island, where you can be virtually alone as the only people visiting. Each village typically had an ahu if not several moai, and thus on a drive around the south coast of the island, every mile contains several sites where you might see ruins. Two exceptional sites are the volcanic craters of Rano Kau and Rano Raraku. The slightly inland quarry at “Rano Raraku” is where the moai carvings were born, out of the hillside of the volcanic rock where hundreds of laborers must have carved full-time. This 300 foot volcano remnant provided the stones for the great figures and is where a visitor can see various stages of the carving, as well as scattered partially-finished figures. A climb to the left side of the crater, over the top, and into the bowl, is well worth it. Hiking to the opposite lip of the crater, where the most moai are found, is one of the most dramatic sites on the island. Similarly, Rano Kau is the remains of a volcanic cinder cone, which like Rano Raraku, is filled with fresh rainwater and has a mottled unearthly appearance that is breathtaking. The entry fee is 60 US dollars total for the two sites. Make sure you keep your ticket. Easter Island features two white sand beaches. Anakena, on the north side of the island, is an excellent shorebreak bodysurfing location with a bit of north swell. Even the 1″ waves barrel (it’s also possible to surf in the harbor at Hanga Roa and many of the locals do so). The second beach is a hidden gem called Ovahe. Found along the southern shore of the island near Ahu Vaihu (along the road from Hanga Roa to Ahu Akahanga), this beautiful and desolate beach is much larger than that at Anakena and is surrounded by breathtaking cliffs. Note of caution: the path leading down to the beach is somewhat treacherous and unstable and best reached by foot – driving off-road (contrary to the misguided and somewhat callous actions of some tourists) on most of the island is illegal anyway. Scuba diving and snorkeling is popular near the islets Motu Nui and Motu Iti (well known for “The bird man culture”) which are located about 1 km south of the island. There are three shops where it is possible to rent the equipment and from there get on a guided tour to the islets: Atariki Rapa Nui, Orca andMike Rapu Diving. An often overlooked but particularily fascinating and “otherwordly” aspect of Easter Island is its extensive cave systems. While there are a couple of “official” caves that are quite interesting in their own right, there is also real adventure to be had in exploring all of the numerous unofficial caves on the island, most of which are found near Ana Kakenga. While the openings to most of these caves are small (some barely large enough to crawl through) and hidden (amid a rather surreal lava strewn field that has been likened to the surface of Mars), many of them open up into large and inhibitingly deep and extensive cave systems. Note of caution: these caves can be dangerous in that quite a few run extremely deep. A person left without a torch/flashlight will be immersed in utter blackness with little hope of finding their way out soon…if ever. The caves are also extremely damp and slippery (the ceilings in some have collapsed over time from water erosion).